Sometimes in life you just need to pull out all the stops and create a show stopper that will impress even the biggest of critics. Only in the past year have I braved the world of puff pastry and you know what Il be hard pushed to buy the shop bought pastry again after realizing how easy and rediculously tasty homemade puff pastry is. I was able to make mine while waiting to collect Lottie from school, I had a three hour gap so I got stuck in and while the pastry rested in the fridge I was able to get on with whatever else needed to be done like the horrible job of doing the dishes or tidying the sitting room for the hundredth time that day. Puff pastry is actually perfect to make when you have two tornados for kids , who would have thought ha. Firstly prepare your puff pastry, you will do this by adding your flour, salt and water to a bowl and mixing well. Empty the bowl out onto your table and knead the detempre for a moment. Wrap in cling film and pop in the fridge for 30 minutes. Once the detempre is chilled enough roll it out into a square shape. Next take your butter and shape it with a rolling pin to a similar shape but smaller and slightly thinner. Place it on top of the detempre then fold over the edges of the dough around it so the butter is enclosed in it like an envelope. Flour your surface well and then proceed to roll out the detempre and butter into a long rectangular shape. Next preheat your oven to 190". Roll out the pastry as thin as possible and depending whether you want one large mille feuille or small individual ones cut the pastry to your desired size. I wanted to make small ones so I cut out small uniform pieces popped them on the dampened baking tray making sure not to distort the shape. Then I sprinkled icing sugar over the pastry. Next place another baking tray on top of the pastry to control an even rise to the pastry and put them in the oven for no more than 15 minutes keeping an eye on them all along. 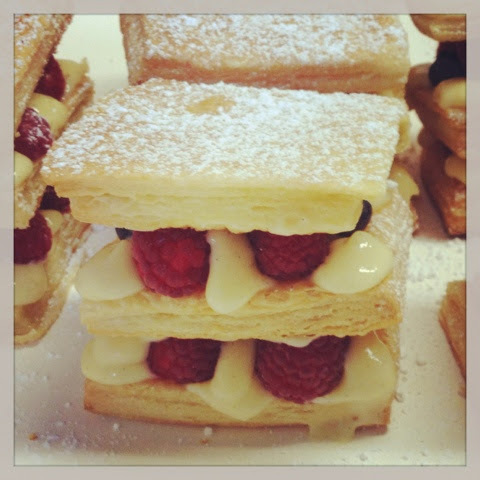 While the pastry is baking you can now make your creme patisserie. Start by combining the eggs sugar flour and a small amount of the milk. As that's mixing heat the rest of the milk and the vanilla in a pot and bring it to the verge of boiling, take it off the heat and pour it into the egg mixture. Rinse your pot out, dry it then return the milk and egg mixture to the pot reduce heat to a gentle simmer and continuously whisk until the pastry cream has thickened. Pour into a jug and place in the fridge to cool. Once your pastry is a golden colour and has puffed up nicely place them gently on a wire wrack and let cool completely. 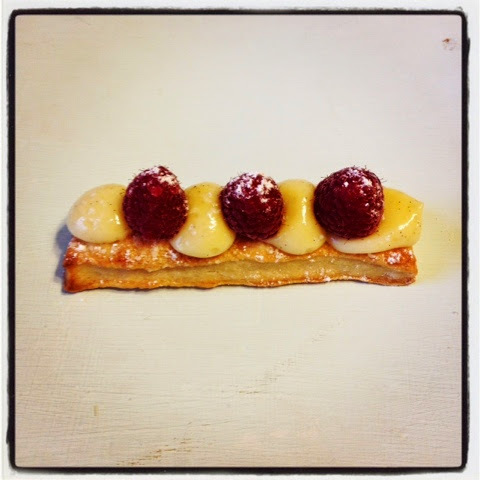 Now it is time to assemble your mille feuille. For the first layer I like to pipe blobs of the creme patisserie onto the pastry leaving small gaps for the raspberries to sit in between them. Next sit the second layer on top and pipe on small blobs of the whipped cream leaving the same space for more raspberries.